In 1989, Eckhardt published his second book, “The Essentials of Beer Styles,” which — along with the books of beer writer Michael Jackson — educated the general beer drinking public on the variety of beers around the world. Echkhardt evangelized for good, flavorful beer in many ways. He wrote a column in Portland’s Oregonian newspaper, long before beer columns were a thing. 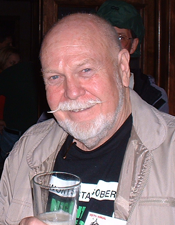 Later he wrote for many beer publications, including a column in All About Beer magazine. He stayed close to his homebrewing roots as the “mascot” of the Dixie Cup — the annual homebrew conference and competition organized by the Foam Rangers (Houston, TX). He attended the first Dixie Cup in 1987 and, two years later, began hosting his annual Fred Tasting — an event where beers were paired with various foods (chocolate being a favorite) — there. This lasted until 2008, when travel became too difficult for him. In Portland, Fred was the inspiration for Fred Fest, which has been held annually since 2005. And of course, Hair of the Dog Brewing’s Fred (a barleywine) is a tribute to Eckhardt. I met Fred a handful of times at various Dixie Cups and a few National Homebrew Conferences. Lots of brewers knew him a lot better than I ever did, but I do have a good Fred story. Somewhere in the early 2000s, I attended the annual competition/conference of the Kansas City Biermeisters, and Fred was a speaker. His mid-morning talk was on creeping neo-prohibitionism in MADD and other organizations. Afterwards, as the judging was winding down, he was sitting by himself and I went over and said hello. We sat talking for a few minutes until he said, “Did I ever tell you the story of how a clerical error saved my life in WWII?” He hadn’t, and here’s the story he told me. Fred was a Marine in WWII, trained as a tail gunner for dive bombers. After his stateside training, he was transferred to Okinawa late in the war. When he arrived, tail gunners were in short supply because — spoiler alert — bad things happen to tail gunners in wartime. Fortunately for Fred, someone had messed his paperwork up. In the box that indicated his specialty, the number and letter combo had him pegged as a mechanic. When he reported for duty as a tail gunner, they wouldn’t let him fly because he didn’t have the right designation. When he later asked if he could help the mechanics out, he was refused because he didn’t have the proper training. So, for a healthy chunk of time — when bad things were happening to other tail gunners, and mechanics were working overtime —Fred sat in his tent in Okinawa because of a typo in one box on his papers. “The inefficiency of the military bureaucracy saved my life,” he said, laughing. I’m not sure how long Fred’s “sitting in his tent” phase lasted. After some brutal air battles in 1944 and 1945, the US gained dominance of the skies in the Pacific. I know that Fred celebrated VJ Day on Okinawa, and later went on to serve in Korea before becoming a beer writer. So I guess his tent-sitting phase lasted long enough to keep him safe. As I said, a lot of other people knew Fred a lot better, but I do have this memory of him telling me a funny story about his time in Okinawa. And I think about it every time someone mentions him.